The horned screamer is a massive 84–95 cm (33–37.5 in) long, 3.5 kg (7.7 lb) bird, with a small chicken-like bill. The upperparts, head, and breast are black, with white speckles on the crown, throat and wing coverts. There is a long spiny structure projecting forward from the crown. This structure is unique among birds and is not derived from a feather but is a cornified structure that is loosely attached to the skull and grows continuously while often breaking at its tip. Horned screamers are large, heavy bodied, fowl-like birds that are most recognizable by their two bone spurs at the bend of each wing and the 15 cm, yellowish-white horn-like projection at the top of their heads. The 2 to 5 cm long bone spurs are a result of fused carpel bones and are covered with keratin. The horn-like projection, which gives these birds their name, is composed of cartilage. When young are born they lack the horn but it slowly grows as they age. Horns seem to be ornamental as they do not have a defensive purpose. They are not firmly attached to the skull, swing back and forth as the birds’ heads move, and are easily broken off. After breaking off they will grow back over time. Now your first question will be: why do they have these unicorn horns? And the answer is, “I have no bloody idea!” My research this morning (granted, enacted at 5 a.m., and without coffee) gives no good answer. Both sexes have the horns, which suggests that it’s either mutual sexual selection or perhaps a form of species recognition, but the males don’t seem to “joust” with these horns, even though the species is territorial. It seems that little is known about this species. If the horn really is “ornamental”, why it’s there is still unclear. “Ornaments” can be involved in sexual selection, but it’s unlikely that only females use the horn to choose males, for it’s found in both sexes, and natural selection would seem likely to eliminate the metabolically expensive and cumbersome horn in females if they don’t “need” it themselves. Animals don’t have such “ornaments” just to look pretty, so it almost certainly evolved for a reason we don’t yet understand. Regardless, the horned screamer is the only unicorn bird I know, and the only bird that has a cartilaginous horn. This entry was written by whyevolutionistrue and posted on November 9, 2017 at 7:45 am and filed under birds. Bookmark the permalink. Follow any comments here with the RSS feed for this post. Both comments and trackbacks are currently closed. Convergent evolution with hot-headed ice borers? Seems more like a turkey. Would guess they don’t do a lot of flying. That Arkive photo makes me wonder how it manages to eat. A thin, cartilaginous rod must have a very low metabolic cost to build and maintain, so it’s probably not a great drain on the owner. If it does have a sexually-selective role, the benefits of having one might outweigh the small cost of secreting it, and the minor inconvenience of carrying it around. After all, male deer produce much larger and more extravagant ornaments, and they have to re-grow them every year. … and natural selection would seem likely to eliminate the metabolically expensive and cumbersome horn in females if they don’t “need” it themselves. Like teats on a bull? Videographer: Look at this bird with the horn– Ooo! Capybara! The Milwaukee Zoo has the closely related crested screamer (Chauna sp. ), where I’ve seen and photographed them. They didn’t have cephalic horns. Weird, but a good reminder that the dinosaurs are still very much among us. Going with evolution by natural selection, it could be a structure that was selected for, and is now fallen into disuse and is vestigial. It could also be a spandrel; a feature that is not a direct result of natural selection but is made as a developmental by-product of genes under selection for something else. It could also be just a feature that became fixed in this species through neutral genetic drift. I wonder if by any chance this bird may be related to the Invisible Pink Unicorn? More likely a distant cousin of the White-Winged Narwhal. Neat bird. With such a large range, I would think it is a common bird, so I’m surprised not much is known about it. Perhaps South America’s jungles impede investigation. This bird is proof that there is no God. Or that he’s a real weirdo. Check out the Horned Guan of a very small area in southwest Mexico and adjacent Guatemala. It has a blazing red horn (made of what I do not know) and is a much rarer bird (and more endangered) than the Horned Screamer which is not difficult to find in S. America. I lived on a Mexican volcano for six months looking for that guan and the other special endemics of the area, particularly the Azure-rumped Tanager. The Horned Guan is a magnificent bird! But the Horned Screamer is also amazing. They have a very bizarre sound that carries long distances. 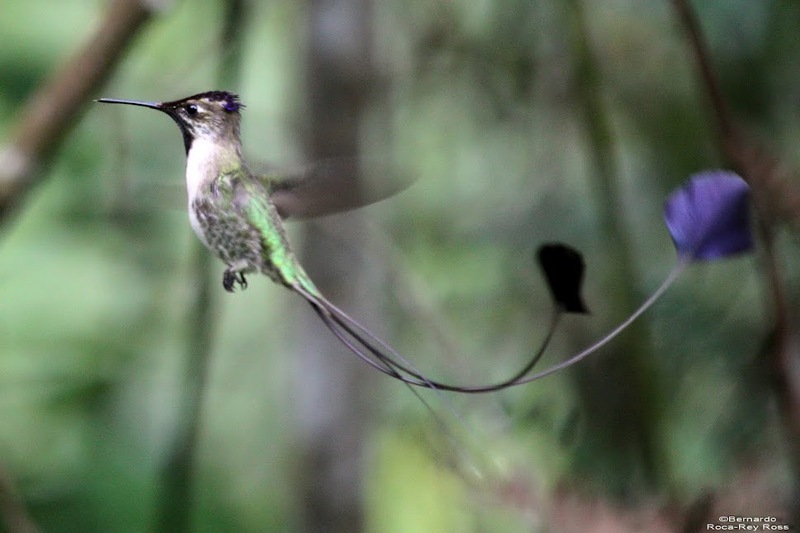 They fly well and the local Amazonian tribes say they have bubbles in their bodies so they are lighter than they look. Or could it be akin in use to a cat’s whisker or a helpful positioning/balancing device?